Some weeks later, with pen, ink, scissors, paste, a decanter of sherry, and a vast reluctance, Mr Earbrass begins to revise TUH. This means, first, transposing passages, or reversing the order of their paragraphs, or crumpling them up furiously and throwing them in the waste-basket. After that there is rewriting. This is worse than merely writing, because not only does he have to think up new things just the same, but at the same time try not to remember the old ones. Before Mr Earbrass is through, at least one third of TUH will bear no resemblance to its original state. 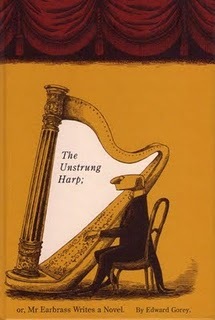 Most novelists recognise something of themselves in the late great Edward Gorey's Mr Earbrass - written in 1953, The Unstrung Harp is still one of the funniest and truest descriptions of writing a novel. Revision isn't much easier with word processing, but I find it's a lot more fun than wrestling with the seemingly infinite snake of the first draft. I know now what my characters will and won't do, for instance. And it's a lot easier going along with what they want, than trying to push them in directions they don't like. Meanwhile, I'm too distracted to do this blog much justice, but I'm still blurting out bits of nonsense over on Twitter. Uses a different part of the brain.